This is the official home page for the American Red Cross organization (ARC), also known as the American National Red Cross, which is a volunteer-led, humanitarian organization that was founded in 1881 by visionary leader Clara Barton. The site extends ARC’s efforts online in providing emergency assistance, disaster relief and education inside the United States. This site is also a powerful communication, recruiting and fundraising tool. 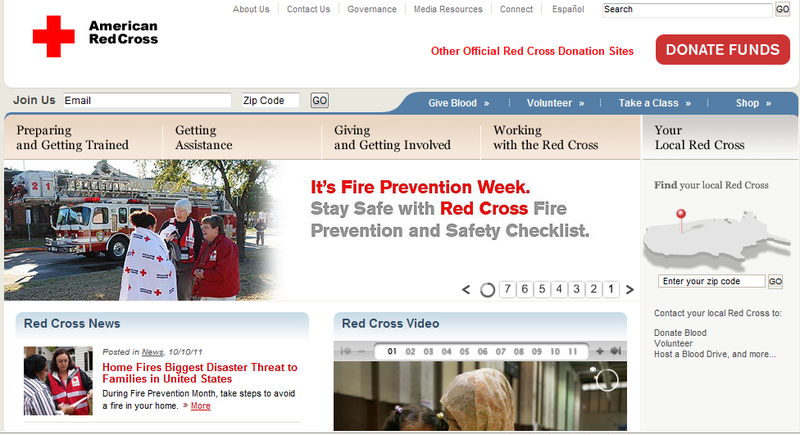 The American Red Cross website is fully localized into Spanish, by simply clicking on the Espanol button. From a visual appeal stand point there seems to be a theme of red, white and gray colors inspired by the iconic Red Cross symbol, which is prominently placed in the upper left corner (as it should). The site is structured to list content in 3 main columns with main categories and information tabs listed across the top for ease of reference. Clearly, the site is designed to engage visitors as indicated by the heavy focus on social media interaction (which will be discussed in depth later) and the promotion of the various call-to-action opportunities, such as Donate, Join, Find, Give Blood, Volunteer, Take a Class, and Shop. The site is also organized in a manner that offers loads of rich content such as videos, photos, and reports from the various programs across the country without feeling crowded or overwhelming. We believe the white background offsets certain elements such as moving top stories and pop out captions. 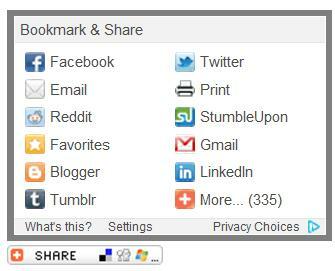 All content is clickable or can be selected from drop down menus for speed and efficient browsing experience. The site targets a broad group of audiences; mainly those individuals (and sometimes even groups or businesses) who are interested in getting involved to help out or simply want to learn more. There is no clear indication of gender differentiation, however given that one of the main objective to the site it to enlist volunteers and solicit financial support, it is safe to assume that the age of the target audience ranges from 18 to 55. As mentioned above, with the heavy focus on social media outlets, the site is targeting people who are active on Facebook, Twitter, You Tube and so on. How to get help: Educate visitors and inform them of current programs available to them in their areas, provide preventative advice, answer questions and link to helpful sources and websites. 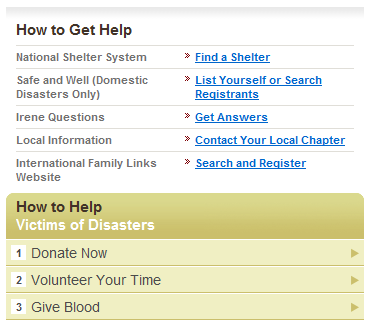 How to help: As mentioned earlier, the site is clearly aiming to drive engagement among interested individuals or groups to entice them to take specific actions such as donating (time or money), locating local Red Cross offices, joining the org and even simply giving blood. The site also offers information “about” the org, its governance, media resources and how to contact the different chapters or main office. The site heavily leverages, and integrates social media right from the start on the front page. Either by clicking on the different icons as shown below or by clicking on the “Connect” tab for a more detailed and comprehensive experience, the site encourages visitors to interact and stay informed and connected via countless ways. For example, visitors may link to the American Red Cross Blog, Chapter Blogs and even Youth Blogs (with the option to subscribe via email, and fave the blog on technorati). Visitors may register to receive alerts from Disaster Online Newsroom, follow the group’s Photostream on flickr, follow ARC nationally and locally on Twitter, find the organization’s page, group, and cause on Facebook, subscribe to ARC Channel on You Tube, listen to Cross the Globe Podcasts where twitter feed is embedded, visitors also can subscribe to listen to pods through iTunes , learn about the “LinkedIn for Good” program, with links to ammado and Social Vibe. As mentioned earlier, visitors may log to the blog site powered by wordpress, and subscribe to RSS feed (entries and comments), and subscribe to the blog via email. Visitors may log in or sign up to “fave this site on TECHNORATI” too. There is a search box on ARC’s the website and its blog, and a shopping cart.